If you answered D, congratulations, you’ve passed the test. Hopefully you didn’t bribe a proctor to give you the answer. In March, the FBI found over 30 wealthy families guilty of paying off tutors and coaches to falsify application materials in an attempt to secure spots for their children at elite universities. The recent admissions scheme underscores the role of race and class discrimination in the college application process. One family paid $251,000 in stock to have their daughter be recruited for UCLA’s soccer team. Another bribed a student to pose as their child and take classes for them. In some instances, parents paid to have photos doctored so it would look like applicants participated in sports. A federal court in Boston charged parents and coaches involved in the 2019 admissions scandal under conspiracy to commit mail fraud and honest services mail fraud, both felony charges. Upper classes have been paying their way into college for generations — there’s almost always a self-serving reason behind donating a library or lab building. It’s time we recognize these tricks don’t just get privileged people further ahead, they exacerbate systemic disadvantages. The affluent, mostly white families who spent hundreds of thousands to fake documents could be served jail time, but they have the resources to hire high-powered lawyers, battle this out in court and pay upfront any fines or tax penalties. Parents who donate millions so their kids can get into top schools are turning admissions into a space for aristocracy, not meritocracy. 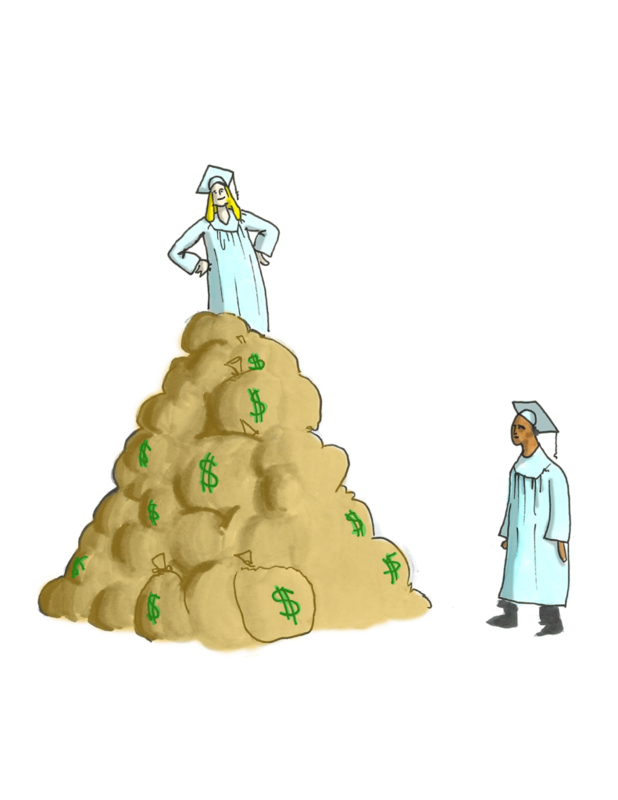 Low-income and underrepresented students work themselves ragged to get into the same universities as those who buy their way in. But when marginalized students succeed, they are scrutinized. Florida student Kamilah Campbell was presumed guilty when her SAT scores improved by 300 points. The organization in charge of administering standardized tests, Education Testing Services (ETS), invalidated her scores and launched an investigation after accusing her of cheating. Doubt, distrust and prejudice are extra hurdles on an already uneven playing field. Privileged students not only have access to private tutors, parents familiar with higher education and connections to people in high society, they are privileged from the moment they walk in the door. If communities of color are involved in schemes to cheat to get ahead, there is disproportionately severe punishment. In 2014, a group of Black educators from Atlanta were charged with racketeering when they conspired to artificially boost student test scores. Jerry Baxter, the white judge overseeing the case, handed down sentences including prison time, probation and community services. Unlike those who used extortion to get accepted, Atlanta educators weren’t exacerbating socioeconomic disadvantage by lying to maintain class divides, or taking spots at school from anyone who needed them. Generations of wealth lets super rich students bypass hard work and coast on their connections. Legacy admissions also ensure wealthy families have a better chance of being admitted, regardless of their academic qualifications. The way college entrance exams are designed widens achievement gaps between white students and students of color. Trends since the early 1970s confirm the SAT favors white male test takers. SAT scores also correlate with household income, wealthier students score higher across the board. If kids who are wealthy and white can’t score well on a test skewed in their favor, they don’t deserve to be admitted to top schools. When some students are already working twice as hard to get the scores they deserve, bribing and cheating is a disgusting display of entitlement. Instead of accepting a system where inequality incentivizes cheating the system, we must invest in public schools. We must reimagine standardized tests and demand education establishments remove race and class advantages. We must fight for affordable college and do away with legacy admissions to ensure all students have equal opportunities. It’s unacceptable to ignore the privileges that guarantee wealthy students admission and leave others to fend for themselves.